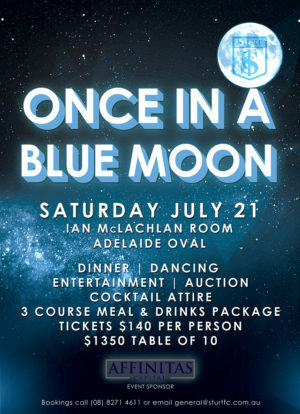 The Once in a Blue Moon Gala is this Saturday, July 21. We’re so excited to dance the night away and help raise funds for the Building the Blues Grandstand Development Project. To purchase your ticket, click here or call the club during business hours at (08) 8271 4611. The Silent Auction is open to everyone, even if you can’t be with us on the night! To view the item catalogue, click here . To register to bid, click ‘Register’ via the link above and enter your phone number. You will then receive a text message confirming your registration. Auction will open Monday, July 15. There are some excellent items, and the option to donate to the fundraising as well!